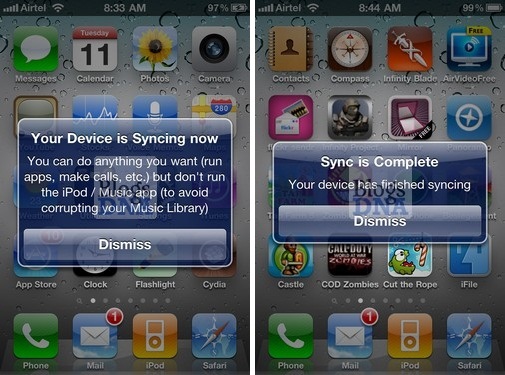 We are sure the inability to use iPhone while it is being synched with iTunes is frustrating for many. Worst if sync process takes like 2-10 minutes to complete due to large songs library or large number of installed apps. Here is some thing for those users, Cydia app FreeSync that will get rid of your frustration. FreeSync is a tweak that allows you to use your iPhone while syncing. An alert will notice you when the sync starts and when it ends. You can enable or disable the tweak via the Settings app. You can also set an option to show your lockscreen’s wallpaper during sync if the FreeSync mode is disabled. FreeSync is available for purchase at $1.00 from Modmyi Cydia repo. Next Entry: Google TV Jailbroken, Angry Birds Coming Soon?